The Apostolic Age of the history of Christianity is traditionally regarded as the period of the Twelve Apostles, dating from the Great Commission of the Apostles by the risen Jesus in Jerusalem around 33 AD until the death of the last Apostle, believed to be John the Apostle in Anatolia c. 100. Traditionally, the Apostles are believed to have dispersed from Jerusalem, founding the Apostolic Sees. It holds special significance in Christian tradition as the age of the direct apostles of Jesus Christ. One major primary source for the "Apostolic Age" is the Acts of the Apostles, but its historical accuracy is questioned by some and its coverage is partial, focusing especially from Acts 15:36 onwards on the ministry of Paul (not one of the twelve apostles) and his companions, and ending around 62 AD with Paul preaching in Rome under house arrest. According to most scholars, the followers of Jesus were composed principally from apocalyptic Jewish sects during the late Second Temple period of the 1st century. Some Early Christian groups were strictly Jewish, such as the Ebionites and the early-church leaders in Jerusalem, collectively called Jewish Christians. During this period, they were led by James the Just. According to Acts 9:1-2, they described themselves as 'disciples of the Lord' and [followers] 'of the Way', and according to Acts 11:26 a settled community of disciples at Antioch were the first to be called 'Christians'. 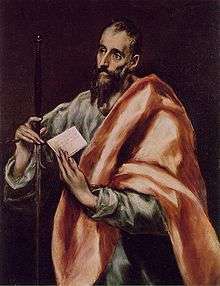 Saul of Tarsus, commonly known as Paul the Apostle, persecuted the early Jewish Christians, such as Saint Stephen, then converted and adopted the title of "Apostle to the Gentiles" and started proselytizing among the Gentiles. He persuaded the leaders of the Jerusalem Church to allow Gentile converts exemption from most Jewish commandments at the Council of Jerusalem. 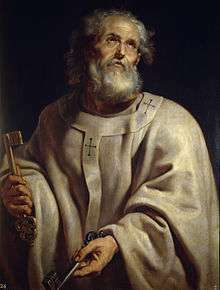 According to the Oxford Dictionary of the Christian Church, Paul's influence on Christian thinking is more significant than any other New Testament author, however the relationship of Paul the Apostle and Judaism is still disputed today (see the link for details). After the Destruction of the Second Temple in AD 70 during the First Jewish-Roman War, or at the latest following the Bar Kokhba revolt of 132, Jerusalem ceased to be the center of the Christian church, its bishops became "suffragans" (subordinates) of the Metropolitan bishop of Caesarea. In the 2nd century, Christianity established itself as a predominantly Gentile religion that spanned the Roman Empire and beyond. The apostolic period between the years 30 and 100 produced writings attributed to the immediate followers of Jesus Christ. The period is traditionally associated with the apostles, hence the tags "apostolic times" and "apostolic writings". The early church associated the New Testament books with the apostles. Modern "liberal" scholarship has cast doubt on the authorship of some New Testament books - however, most accept that the New Testament books were written during this period. In the traditional history of the Christian church, the Apostolic Age was the foundation of the church's history. The Apostolic Age is particularly significant in Restorationism, which claims that the period exhibited a purer form of Christianity that should be restored to the church as it exists today. The unique character of the New Testament writings, and their period of origin, is highlighted by the paucity of their literary form in later writing. Once the canon of the New Testament began to take shape, the style ceased to be used on a regular basis. Non-canonical writings persisted, but died out within a historically short period of time. Early patristic literature is dominated by apologetics and makes use of other literary forms borrowed from non-Christian sources. According to modernist higher criticism scholars who emerged since the 18th century in Protestant Europe: Early Christianity was a Jewish eschatological faith. The Book of Acts reports that the early followers continued daily Temple attendance and traditional Jewish home prayer. Other passages in the New Testament gospels reflect a similar observance of traditional Jewish piety such as fasting, reverence for the Torah (commonly translated as "the Law" in English translations of the Bible) and observance of Jewish holy days. The earliest form of Jesus' religion is best understood in this context. However, there was great diversity in local variations, as each succeeded or failed in different ways. Regardless, Jesus was a pious Jew, worshipping the Jewish God, preaching interpretations of Jewish law and accepted as the Jewish Messiah by his disciples. Proponents of higher criticism claim that regardless of how one interprets the mission of Jesus, that he must be understood in context as a 1st-century Palestinian Jew, stemming from the 12 tribes of the Holy Land. Orthodox and Catholic Christianity, including the Church Fathers, on the other hand, tend to place a sharp distinction between Israel (which the Church claims to be the heir of) and the Pharisees (i.e. - "Jews", forefathers of modern Judaism), as well as placing a central focus on his divine nature. 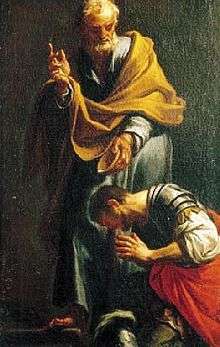 Thomas the Apostle brought Christianity to the southern Indian Malabar Coast, reputedly in AD 52 and from this developed the Saint Thomas Christian tradition or "Thomasine Christianity". These Syrian Malabar Nasrani Christians maintained a unique Christian identity until the arrival of the Portuguese in the 17th century. 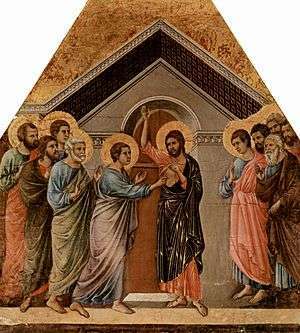 ↑ Catholic Encyclopedia: Dispersion of the Apostles: "The object of the feast (so Godescalcus) is to commemorate the departure (dispersion) of the Apostles from Jerusalem for the various parts of the world, some fourteen years after the Ascension of Christ." ↑ Catholic Encyclopedia: Jerusalem (A.D. 71-1099): "As the rank ..."
↑ Brown (1993). p. 10. ↑ Brown (1993). pp. 10–11. ↑ Taylor (1993). Pg 224. ↑ Pelikan (1975). Pg. 113. ↑ White (2004). Pp 127–128. ↑ Ehrman (2005). Pg 187. ↑ Wylen (1995). Pg 133, 136. ↑ Thiede (2003). Pp 189–192. ↑ Freedman (2000). Pg 285. ↑ McGrath (2006). Pg 174. ↑ McGrath (2006). Pp 174–175. ↑ Catholic Encyclopedia: Jerusalem (A.D. 71-1099): "Epiphanius (d. 403) says that when the Emperor Hadrian came to Jerusalem in 130 he found the Temple and the whole city destroyed save for a few houses, among them the one where the Apostles had received the Holy Ghost. This house, says Epiphanius, is "in that part of Sion which was spared when the city was destroyed" — therefore in the "upper part ("De mens. et pond. ", cap. xiv). From the time of Cyril of Jerusalem, who speaks of "the upper Church of the Apostles, where the Holy Ghost came down upon them" (Catech., ii, 6; P.G., XXXIII), there are abundant witnesses of the place. A great basilica was built over the spot in the fourth century; the crusaders built another church when the older one had been destroyed by Hakim in 1010. It is the famous Coenaculum or Cenacle — now a Moslem shrine — near the Gate of David, and supposed to be David's tomb (Nebi Daud). "; Epiphanius' Weights and Measures at tertullian.org.14: "For this Hadrian..."
↑ Schaff's Seven Ecumenical Councils: First Nicaea: Canon VII: "Since custom and ancient tradition have prevailed that the Bishop of Aelia [i.e., Jerusalem] should be honoured, let him, saving its due dignity to the Metropolis, have the next place of honour. "; "It is very hard to determine just what was the "precedence" granted to the Bishop of Aelia, nor is it clear which is the metropolis referred to in the last clause. Most writers, including Hefele, Balsamon, Aristenus and Beveridge consider it to be Cæsarea; while Zonaras thinks Jerusalem to be intended, a view recently adopted and defended by Fuchs; others again suppose it is Antioch that is referred to."